Help I've woken up and can't move my neck! It is really not that uncommon that people will go to bed one night with their neck feeling fine then wake up the next morning with significant neck pain. Sometimes this pain will be there as soon as they wake up and other times there will be a slight feeling of stiffness and then with one movement, or another, the pain suddenly gets a whole lot worse. The good news is that in the vast majority of cases people get better and these incidents don’t go onto cause long term discomfort. 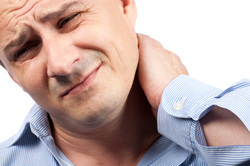 Physiotherapists have been trained to help people with many different neck pain problems. There are many techniques that the physiotherapist might choose to use to help you. These can include massage, mobilization, stretching as well as advice and assurance on the best way forward. There are occasional times when the best option can be to see other medical professionals and your physiotherapist can help to guide you if this is the case. muscles healthy. The best approach is to use as much gentle movement as you can that does not worsen the discomfort. It is quite common one direction of movement is significantly more uncomfortable than the other. For example you might be able to look a long way to the left but hardly be able to move to the right. For this example a good approach is to use the movement to the left and not the uncomfortable movement to the right. In most cases people find that over the first 1-3 days the movements become progressively less uncomfortable. If you know that your system can handle certain types of pain relief then you can use these. Always follow the directions on the packaging and always consult a doctor or pharmacist if you are unsure. Different people and different injuries respond differently to heat and ice. A good option can be to try each (1 hour apart) and see which gives you more pain relief. For both heat and ice use it for 10 mins on and 10 mins off. Some people can also respond well with alternating the two, still with a 10 min rest period between. Never apply either heat or ice directly to you skin, always have at least one layer of towel protecting your skin. It is also good to check the heat of hot packs with your hand for a minute before applying to your neck. housework. In general a better medium and long term outcome is achieved by the people that return to these activities sooner rather than later.